The Remington® Model 870™ Pump-Action Shotgun is one of the most proven firearm’s designs in history. The 870 Express® is a rugged, value-priced workhorse, making it one of the most useful tools that a shooter can own. 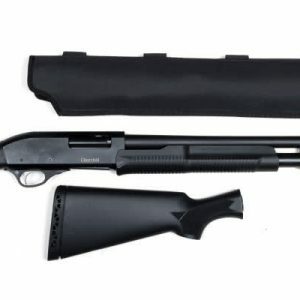 The versatile, no-nonsense 870 Express with Extended Magazine can be used for a home defense shotgun, a tactical shotgun, or a camp gun in bear country. The 18-1/2″ barrel has a fixed cylinder choke for optimum performance with buckshot and slugs at close range. A myriad of aftermarket Remington 870 accessories enables owners to customize the 870 Express for specific purposes. At the heart of the ultra reliable 870 Remington is a receiver milled from a solid billet of steel for maximum strength, and twin action bars that prevent binding and twisting while cycling the action. 870 pump shotguns have great pointing characteristics. They come to the shooter’s shoulder and acquire targets instinctively. The Remington Model 870 Express Synthetic Pump-Action Shotgun comes with virtually indestructible black synthetic stock and fore-end that are impervious to water, and a non-reflective matte black, bead-blasted finish on the receiver and barrel. Sling swivel studs provide the quick attachment of a sling to free the user’s hands while carrying the gun. A durable, rubber recoil pad dampens recoil and helps shooter to stay on target for fast follow up shots.